West Palm Beach, Fl. – It was over a few seconds after the starting box opened! 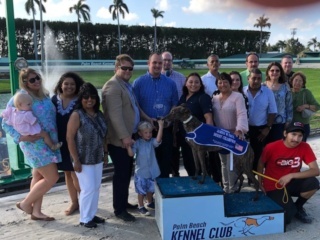 It was D. Q. Williams Kennel’s Elizabeth Banks putting on an Oscar winning performance in going box-to-wire to win the 88th running of Palm Beach Kennel Club’s $50,000 James W. Paul 3/8ths Mile Derby. After the break and the finalists entered the first turn, it was close with Elizabeth Banks holding a slight lead over the Derby finals other early-speed finalist, Pat C Verona. Both were being chased by the second wave consisting of Daniel Craig, Newburyport and KB’s Davilla. Entering the backstretch, it was Elizabeth in command and continuing to be pursued by Verona, Daniel Craig, Newburyport and KB’s Davilla with O Ya Fire Fly starting to fire on the inside. By the time the finalists reached the top of the homestretch, Elizabeth Banks had extended her lead and it was clear who the star of this movie was going to be. The battle was now for the co-stars. And what a battle it was. Six Greyhounds were within a length of second through sixth place. It would take a photo to determine who the also-rans were going to be. And of course, it would just make sense, the other Derby finalist with the name of a movie star, Daniel Craig, claimed the second-place purse. It’s one of those racing coincidences that we love! Newburyport and O Ya Fire Fly finished third and fourth, respectively. Elizabeth Banks collected a cool $25,000 for her 37-seconds run of fun in the south Florida sun and returned $4.20 to her many, many supporters. This was the 88th running of the Derby, one of the nation’s longest-running stake events, and is named in honor of humanitarian, greyhound owner and dedicated supporter of greyhound adoption, James W. Paul. Re: ELIZABETH BANKS WINS PBKC's $50,000 JAMES W. PAUL 3/8THS MILE DERBY!